Everywhere in Ireland there is something of interest or beauty or wonder. It might be a spectacular landscape, or some fascinating industrial curiosity, or just a conversational encounter with one of the gentle people of the country. This book tells the story of a journey around Ireland, on foot over many years, and of the little adventures that befell the rambler on his way. While the land became flooded with mobile phones and iPods and the Celtic Tiger roared briefly before slinking back to his lair, the happy wanderer hobbled onward round the coastal counties, soaking up the landscape (sometimes literally) and enjoying the company of chance-met people. The rambler was in no hurry - just as well, as it took him thirteen years to circumambulate the country. There was only one rule: the rambles should all join up to form a continuous circuit of the island of Ireland. A few stages were done out of sequence and a few in reverse direction, but together they formed a complete route around the island. Nothing bad happened: no muggings, no robberies, no accidents, no serious mishaps; indeed nothing at all, really, yet it was a wonderful adventure. Each day brought new and interesting things to see, and fascinating people to meet. This generous journey - this commodious vicus - was part pilgrimage, part adventure travel, part educational tour and part zen experience, but above all it was enormous fun. In Rambling Round Ireland, Peter Lynch invites the reader to join him as he looks back at his marvellous travels. 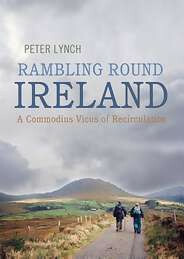 A trove of local history, wit and insight, Peter Lynch's ramble around Ireland takes the time to look and learn. At the start of his rambles, Peter Lynch was the Deputy Director of Met eireann in Glasnevin, and by the time he completed them he had become the Met eireann Professor of Meteorology at University College Dublin. He lives in Glenageary, County Dublin.